Helbert appeared on WDEF, Chattanooga's CBS affiliate. 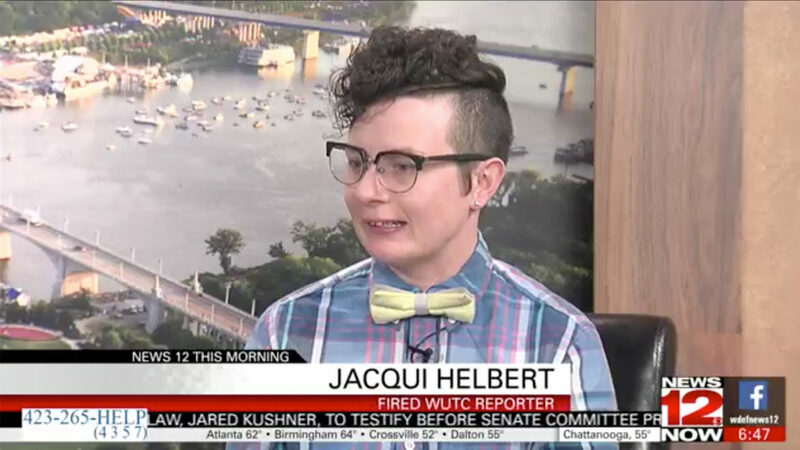 You could not make up a better cautionary tale about the hazards of universities controlling public broadcasters than the story of Jacqui Helbert’s firing. The head PR flack for the University of Tennessee at Chattanooga fired Helbert last month from her reporting job at WUTC, the university’s NPR station. That a flack had the power to fire a journalist is ethically troubling all by itself. Add to that the element of state legislators who control the university’s purse strings complaining about her work, and you have perfect storm of conflicting interests. This week’s episode of The Pub is partially an adaptation of an article I wrote for Columbia Journalism Review. We revisit what was arguably the first high-profile case of interference with public media content (1980’s “Death of a Princess” controversy), get some dish from a WUTC insider, and discuss better ways to run a university station with Judith Smelser, Ted Krichels and others. Please subscribe to The Pub in iTunes or your favorite podcast app, and leave a rating and a comment! That will help boost our search results and allow people to find the show more easily. ‘The Pub’ #93: Where will all the spectrum auction money go? The billions that noncommercial stations won isn’t enough to transform the entire public media system, but it will absolutely transform the handful of stations lucky enough to have held valuable spectrum in crowded markets. And what’s up about a new contract with the NewsHour?